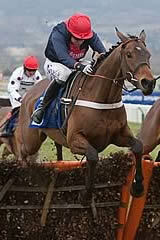 Bobs Worth proved that he is the real deal with a convincing victory in the Hennessy Gold Cup at Newbury. Last season's RSA Chase hero was giving trainer Nicky Henderson his second success in the race and jockey Barry Geraghty his first. Leading at the final fence in an incident-packed race, the 4-1 shot strode away to score from Tidal Bay, with gallant Irish raider First Lieutenant third and The Package fourth. Henderson said: "It wasn't until I looked at him three nights ago at evening stables that I thought he was ready, it was like a rose coming out to bloom. He was always thought to be the classiest horse in the race and in a way he had to win it, but I am mighty glad that he has. "He is so tough and he's owned by a bunch of my oldest mates, so this is for them more than anything. "From now on it's a matter of plotting a gentle path to Cheltenham (for the Gold Cup). I don't think Kempton is his track, it's a matter of how we get there. One run would do me to be honest with you." Paul Nicholls said of Tidal Bay: "He ran a great race and if Bobs Worth is going to be a Gold Cup horse he probably had to beat us like that. "He's been beaten three lengths under a huge weight and we will go to the Lexus now." Mouse Morris, trainer of First Lieutenant, said: "He's run a cracker, he's a spring horse and would have preferred better ground but I'm not using that as an excuse. He'll go for the Lexus."